4-miles one way, mostly flat. Blazed blue. This footpath mostly follows the bed of the Rochester and Eastern Interurban trolley. It has a surface of small cinder, dirt and grass, with some sidewalk. It consists of several distinct sections each with its own personality. It is named for The Rochester & Eastern Rapid Railway, an interurban trolley that ran between Rochester and Geneva from 1903 to 1930. This section is shared with the Dryer Trail. The Trolley Trail begins at the intersection of NY96 and Main Street Fishers. It uses sidewalks along NY96 to the sidewalk entrance to the Victor Inn – Best Western, and goes through that parking lot to Omnitec Place where it goes away from NY96. The Trolley Trail leaves Omnitec Place (between Phillips Rd and NY96). It crosses the Lehigh Trail at the north side of Lehigh Crossing Park. Just to the east of this crossing are the concrete abutments which carried the bridge so the trolley could cross the Lehigh Railroad. After crossing the Lehigh Trail, it enters Lehigh Crossing Park in woods. When it enters the meadow, the Trolley Trail goes to the left and the Dryer Trail turns to the right. 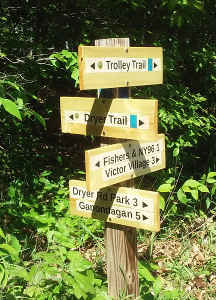 NOTE: both trails are blazed blue; there is a directional sign at the junction. Several park trails intersect it. It is primarily through woods and meadows, and connects with the park trails. It crosses the East Branch of Irondequoit Creek. The section from the bridge to NY251 is through woods and along side a stream which is prime beaver country. It has a dirt and grass surface, 2- to 3-feet wide. Here the Trolley footpath parallels the multi-use Auburn Trail. The electric powered trolley and the steam powered Auburn Road trains sometimes would have a "race" along this section. There are several cross links between the two trails. For a while, the Seneca Trail joins the Trolley. This section ends at the Seneca just where it meets the Auburn. It has a dirt and grass surface, 2- to 3-feet wide. Seneca Trail to School St.
School St. to Maple St. Here the Village of Victor has improved the trail to hard black top, 8-feet wide. It crosses both Great Brook and the rail road track. This is a short spur entrance trail. See above. We hope ultimately have the missing link west of the Village opened. Also, at the east end, a connection from Victor Municipal Park back to the Auburn Trail.